Not many people know I actually studied fashion and developed my own collections. After University however I chose a different career path but have always such a passion for fashion and new designers. 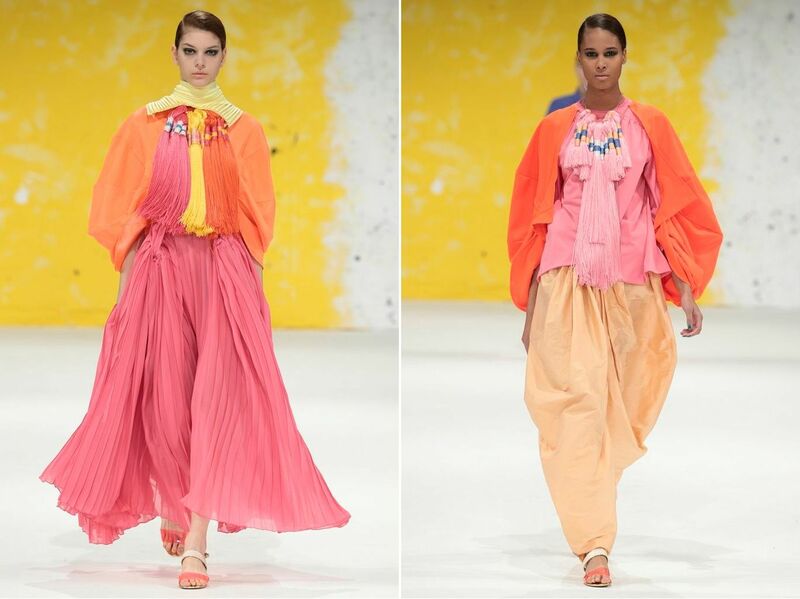 When I saw Lisa McConniffe, a recent graduate of Manchester School Of Art and her bright coloured final year collection I instantly loved it. The unique and inspiring direction it takes is what fashion is all about. 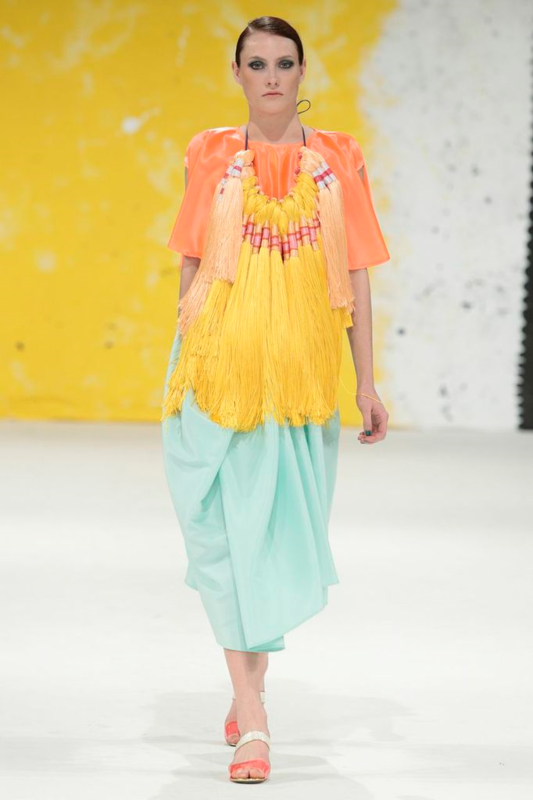 Lisa was recently a runner-up in the British Fashion Council Warehouse competition, has already been featured in Vogue and is now competing to win a top prize as part of the Young Vision Award – Muuse x Vogue Talents 2013. You have been nominated for this years Muuse x Vogue Talents competition, can you tell me a little bit more about it and what it would mean for you to win? I’m absolutely delighted to have my collection nominated for the Muuse x Vogue Talents 2013 competition this year! MUUSE is a fabulous international label that internationally represents design talent from around the world. The opportunity to produce a capsule collection and feature in Vogue Italia is really an incredible prize and to win would be the ultimate dream come true especially for a new designer. I’d be so grateful. Do you have a favourite piece from your latest collection, if so what inspired it? 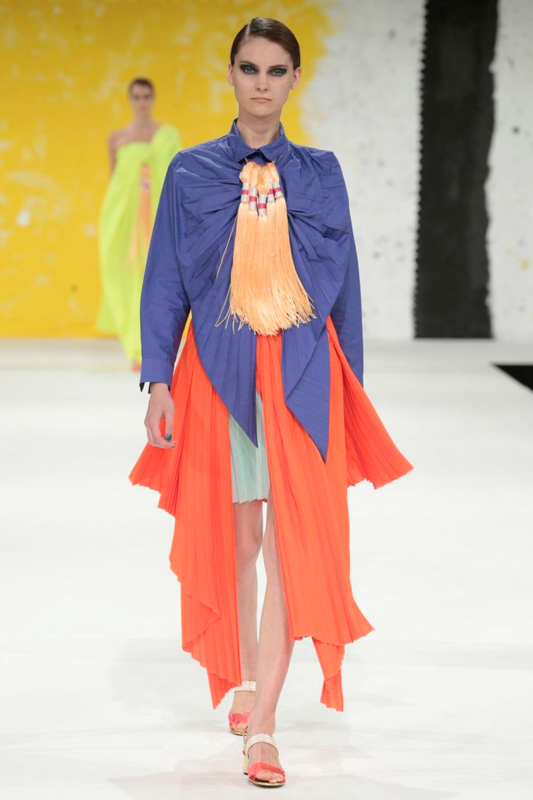 The favourite piece from my collection is the two-tone pleated skirt (Mint green and brilliant orange). The skirt is inspired by the beautiful construction of turbans, which informed my shape making techniques, including structural pleating. The colours are inspired by the bright Sikh warrior turbans and help communicate a playful elegance within the collection. Already you have a great list of achievements, including being spotted by Ozwald Boateng, how did that come about? Thankyou! I’m quite overwhelmed at the moment! The Ozwald Boateng opportunity came about through graduate fashion week, I was spotted by the head designer Jazz and was invited to an interview to discuss my work further. Recently you came runner-up in the British Fashion Council Warehouse competition, how did you find that experience? The Warehouse and British fashion council was a wonderful experience and was so grateful to be chosen for the interview, all the warehouse staff were very friendly and welcoming. I’ve got to admit it naturally it was a bit daunting presenting in front of such industry professionals (such as the head of the British Fashion Council), however my collection and work is something I am very passionate about and I let that take over within the interview process. If you could collaborate with any designer or store who/which would it be? I’m influenced by the powerful use of colour (particularly bright), I like how they vary in shades , brightness and hues but also how different combinations can create an instant confidence in the mood and outlook for both the wearer and the designer. So for me Roxsanda Illnic would be the perfect designer to collaborate with she inspires me with how clever she is with colour but she also makes something different, wearable and a bit edgy. Being a graduate of Manchester School Of Art, how did you find the Manchester street fashion? It’s very easy! As a fashion student your working within the Manchester school of art faculty so your constantly surrounded by creative students and practitioners, so you come across some quirky outfits, however I enjoy the Northern Quarter best for fashion. Ultimately it’s difficult to describe, but particularly for me when I see an outfit on someone that stands out as being edgy but looks effortless, that to me comes across more creatively distinguished rather than the attention seeking street fashion and that’s what inspires me. Everyone loves a random fact, what’s your favourite colour? That’s a tough one! But I love yellow. Thanks so much for your time Lisa! You can read more about Lisa on her website and make sure you vote for her to win the Muuse x Vogue Talents 2013 award, click here to vote.